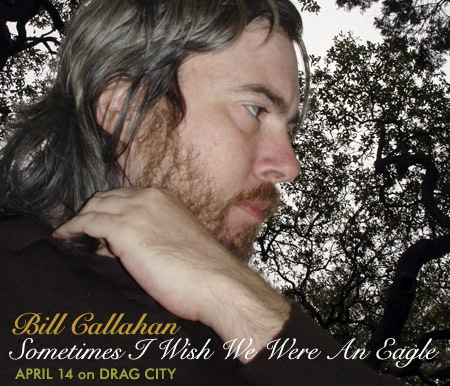 Bill Callahan (aka Smog) has a new record coming out on April 14 entitled Sometimes I Wish We Were An Eagle (Drag City) and he’ll be stopping at NYC’s Other Music on April 18 (Record Store Day) as part of a multi-city “in-store” promotional tour. In case you aren’t able to squeeze into Other Music for what will surely be crowded in-store appearance, Bill will be back in June for two headlining dates, one at Manhattan’s Le Poisson Rouge on June 13, and then the next night at the Music Hall of Williamsburg (as part of the Northside Festival). I’m also assuming there will be an announcement of a proper headlining tour for some time in between April and June. All Bill Callahan tour dates after the jump. You are correct sir. Fixed now.